This image displays the smoothed redshift distribution of galaxies in and around the Vela supercluster (larger ellipse; VSC). The centre of the image, so-called the Zone of Avoidance, is covered by the Milky Way (with its stellar fields and dust layers shown in grey scale), which obscures all structures behind it. Colour indicates the distance ranges of all galaxies within 500 to 1,000 million light-years (yellow is close to the peak of the Vela supercluster, green is nearer and orange further away). The ellipse marks the approximate extent of the Vela supercluster, crossing the galactic plane. The VSC structure was revealed thanks to the new low latitude spectroscopic redshifts. Given its prominence on either side of the plane of the Milky Way it would be highly unlikely for these cosmic large-scale structures not to be connected across the galactic plane. The structure may be similar in aggregate mass to the Shapley Concentration (SC, smaller ellipse), although much more extended. 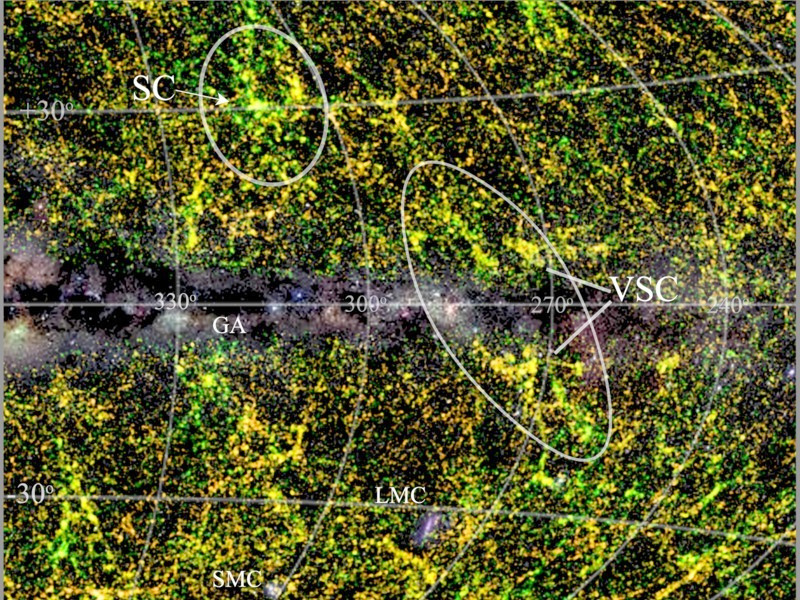 The so-called “Great Attractor” (GA), located much closer to the Milky Way, is an example of a large web structure that crosses the galactic plane, although much smaller in extent than VSC. The central, dust-shrouded part of the VSC remains unmapped in the current Vela survey. Also visible are the Milky Way’s two satellite galaxies, LMC and SMC, located south of the galactic plane. Image credit: Thomas Jarrett (UCT). Superclusters are the largest and most massive known structures in the universe. They consist of clusters of galaxies and walls that span up to 200 million light-years across the sky. The most famous supercluster is the Shapley supercluster, some 650 million light-years away containing two dozens of massive X-ray clusters for which thousands of galaxy velocities have been measured. It is believed to be the largest of its kind in our cosmic neighbourhood. Now a team from South Africa, the Netherlands, Germany, and Australia including two scientists at the Max-Planck-Institut für Extraterrestrische Physik in Garching, has discovered another major supercluster, slightly further away (800 million light-years distant), which covers an even larger sky area than Shapley. The Vela supercluster had gone unnoticed due to its location behind the plane of the Milky Way, where dust and stars obscure background galaxies, resulting in a broad band void of extragalactic sources. 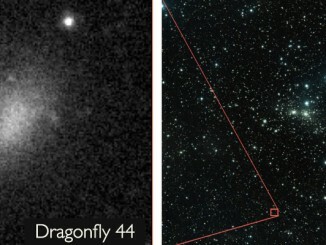 The team’s results suggest the Vela supercluster might be as massive as Shapley, which indicates that its influence on local bulk flows is comparable to that of Shapley. Prof. Renée Kraan-Korteweg from the University of Cape Town, who led this study and has been investigating this region for more than a decade, says: “I could not believe such a major structure would pop up so prominently,” when she and her colleagues analysed the spectra of the new survey. But there is still much to do — further follow-up observations are needed to unveil the full extent, mass, and influence of the Vela supercluster. So far this region of the sky is sparsely sampled, while the part closest to the Milky Way has not been probed because dense star and dust layers block our view. Planned observations with the new radio astronomical facility MeerKAT will in particular help to map this obscured region and further optical redshifts will be obtained with the new large-field-of-view multiobject-spectrograph, Taipan, from Australia. The ongoing survey of X-ray luminous clusters conducted by the MPE team, Hans Böhringer and Gayoung Chon, has recently been extended to cover this region in the band of the Milky Way. The area of the Vela supercluster and its environment will receive special attention. “We already have good indications that the Vela supercluster is embedded in a large network of cosmic filaments traced by clusters, providing insight into the even larger-scale structure embedding the Vela supercluster. With the future multi-wavelength programme we hope to unveil its full influence on the cosmography and cosmology,” Gayoung Chon remarks. The research appears in the Monthly Notices Letters of the Royal Astronomical Society. 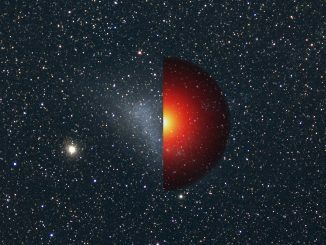 Researchers conducting the Stromlo Milky Way Satellites Survey at the Australian National University discover a small star cluster that is about ten times more distant than the average globular in the halo of the Milky Way. Dark matter, the mysterious substance that constitutes most of the material universe, remains as elusive as ever. Although experiments on the ground and in space have yet to find a trace of dark matter, six or more years of data from NASA’s Fermi Gamma-ray Space Telescope has broadened the mission’s dark matter hunt using some novel approaches.